If you’re visiting Peru, then there is a 99.9% chance* that you’re going to be spending some time in Cusco. You probably already know that it’s pretty close to Machu Picchu (despite not actually being very close), that it’s the most popular tourist city in Peru, and have likely seen some pretty pictures of its main square. But what about everything else? In our main guide on the best things to do in Cusco, we told you all our favourites sights and activities we think you should have on your list, but in order to really prepare for your stay in the one of the most famous cities in South America, we wanted to also give you some of the less obvious but incredibly useful travel tips and insights we’ve learned about the best time to visit, how to get around, how to deal with being that high up, and why you really shouldn’t drink the water. Here’s 18 very useful things to know before you visit Cusco! *We just made that up - it’s probably more like a 100% chance. In total, we spent nine nights in Cusco during our second stint in the city. That’s quite a long time we hear you thinking… well, yes and no. The thing is, whilst Cusco is home to many wonderful sights, ruins and museums, its real benefit is that it serves as a fantastic base from which to trek deep into the Andean countryside and explore the Sacred Valley; a place linked by ancient trails and punctuated with history. The transport connections are great, and we don’t know about you but we much prefer to be able to find one accommodation for a longer period of time in one place and travel out on day trips. Cusco is set at 3,400m, which is no joke for those of us who will be arriving from sea-level (i.e. flying from Lima) or have never been based in cities at such altitude. This means that your first day in Cusco should be about nothing more than acclimatisation - trying to do anything more, or to rush into your first hike or tour, will leave you feeling like crap. Seriously. Instead, drink plenty of water, rest if you feel tired, and limit yourself to an enjoyable walk around the historic old city. From experience, we’ve also learned that walking up and down Cusco’s tiny, steep streets laden with heavy backpacks is not something you want to be doing for longer than necessary when you first arrive, so having at least your first night’s accommodation sorted and booked is a bloody good idea (for backpackers, we recommend Atawkama Hostel or Pariwana Hostel). We’ve never suffered badly from altitude sickness as we understand how horrible its impact can be, but we know many other travellers who have been hospitalised or cut trips short because of it - don’t make yourself one of them and ensure you have at least 24-36 hours to acclimatise before your first hike. We visited Cusco for the second time in early summer, a period when besides the occasional drop of rain, days were warm and short shorts were definitely appropriate. When the sun set however, the familiar cool temperatures that we’ve come to associate with life at altitude set in. Irrespective of time of the year, evenings in Cusco are really quite chilly. To this end, whether you’re travelling in summer or winter (but especially in winter), be sure to pack the appropriate clothing. Fleeces, wooly hats, and even a few thermal tops will be greatly appreciated, as will an accommodation that supplies plenty of blankets. If you find you’re still chilly, just remember that this is Peru - you’re never too far from a stall selling one of those alpaca jumpers. Having travelled quite extensively in high altitude countries, we’ve come to learn that something as simple as boiling pasta gets a little more tricky the further you get from sea level. And Cusco is no exception. You see, at high altitudes, the boiling temperature decreases, which means that anything that requires a traditional boiling temp of 100°C to cook, is going to take an awful lot longer. Definitely not the end of the world, but a little more annoying if you’re staying in a hostel with one pan and everybody wants to boil some pasta! If you plan on doing some cooking whilst in Cusco, then your best option is to buy fruit and veg from one of its excellent markets (like San Pedro), whilst there are several large supermarkets (Orion has a few) in the centro historico which offer a decent selection and plenty options for stocking up on hiking snacks too. Greater Cusco is home to 11,000 street dogs. Even in Peru, where the sight of dogs roaming the streets is common place, this is a huge number. Many seem to go about their business quite happily, forming troops that wander the city in search of entertainment, a nice place to have a snooze, or a tasty snack from a tourist or two. These are often free-roaming dogs; those that technically have a home, a place to return to at night and someone to feed them regularly. Unfortunately however, not all street dogs are so lucky, and even the most stoic of travellers is likely to see a handful that will break your heart. Thankfully, Cusco has a small number of shelters that look out for the most abused, hurt, distressed and injured on the streets - but, as always, they need help. Both Soy Callejerito and Cusco Animal Protection and Rescue take volunteers, organise adoptions and are incredibly grateful for any donations (neither receive government funding). If you’ve got some time and would like to help out, see the links below. It’s also worth noting that most of these dogs will pose you absolutely no safety issues or threat. Having visited Cusco in both high and low season, we quickly became aware of the stark difference between the two; most notably in the number of tourists in the city. High season coincides with the Peruvian winter months (June - September), when rainfall is at its lowest and blue skies are the norm. Because so much of what draws people to this region involves the outdoors, and the dates coincide with the summer holiday season of the northern hemisphere, this does mean that it’s undoubtedly busier in Cusco and all the surrounding attractions at this time of the year,. Unsurprisingly, accommodation prices also increase and availability at the best hostels and hotels is limited (if you’re visiting in high season, booking ahead is absolutely essential). We much preferred our second visit to Cusco, during December and the less crowded low season (December - April). As Cusco is popular year-round, it was of course still busy, but the streets were relatively calm and quiet outside of Plaza de las Armas. Low season months tend to involve a bit more rain, but are almost always warmer. It also means that there is much more availability for last minute tours and accommodation. April - May and Oct - Nov are the shoulder season. Keep reading | Things to know before you visit Peru (out soon). We found this to be especially true when it came to accommodation, and really had to look around for hours to find somewhere within our self-designated budget. Eating at local restaurants for lunch, cooking your own food, and staying at locally-run accommodations or in a dorm will help you save the pennies if you’re a budget backpacker. If you’re arriving on an inter-city bus (most likely to be an overnight one from Arequipa), you’ll get in to the large bus station (also known as ‘Terminal Terrestre de Cusco’). This is located a few kilometres out of town, so you’ll need to jump in a taxi to get to the main city centre and your accommodation. You can certainly try to haggle, but most taxi drivers will stick quite firmly to the standard rate of S/. 10 (£2.2 / $3). For day trips into the Sacred Valley, or any number of day hikes in the Andean countryside, you’ll need to head to the appropriate colectivo station*. To make matters a little more complicated, these are not all in the same place, with vans to different destinations leaving from streets at opposite sides of the city. We did most of our Cusco day trips independently, so information on where the specific colectivos depart can be found in those specific guides. *Colectivo | Essentially a small minibus or minivan that shuttles people between local destinations. These leave when full, as opposed to running to a fixed itinerary and leave fairly regularly. On our first trip to Peru, we were on a very tight budget, and the price of flights were still prohibitively expensive. This left only one choice when it came to travelling between Lima and Cusco: a 24 hour bus. Granted, it was an incredibly fancy bus, with lie-flat seats and tolerable food, but still, it was far from an enjoyable experience. This time, we flew… And an hour after boarding in Cusco, we touched down in Lima. Remarkably, it actually cost about the same as a bus fare, with last minute tickets available for around £45 per person. There are several operators and a load of flights every day (check flights and times on Skyscanner). If you’re short on time, or your Peru itinerary involves going directly between the two cities, then flying really is the best option. Plaza de Armas | This large central square, and its surrounding streets, compose Cusco’s touristic hub. It’s where you’ll find restaurants and bars (albeit expensive ones), the Cathedral and shops selling souvenirs and hiking equipment (but your best bet is to arrive with hiking equipment rather than buy it here). 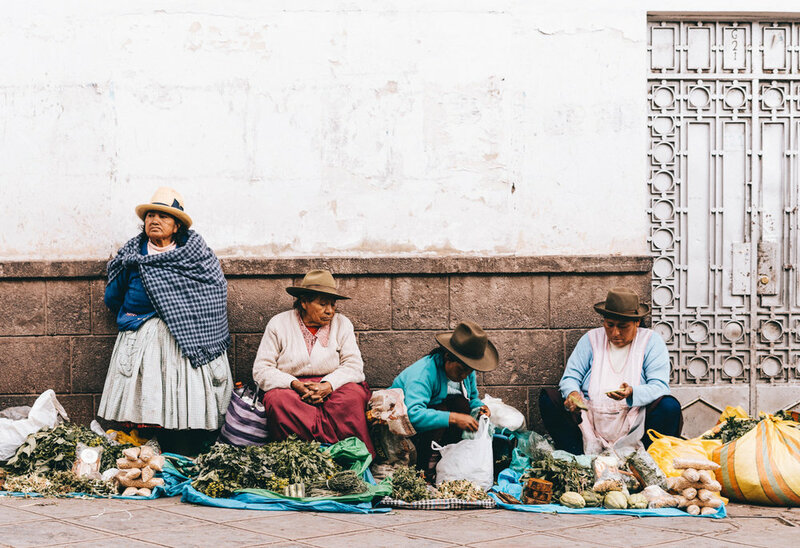 San Blas | As we mention in our ‘Things to do in Cusco’ post, San Blas is so often referred to as the ‘bohemian’ district that it’s become a bit of a cliché. Nevertheless, with its great coffee shops, cool shops and numerous veggie food options, it’s our sort of place to hang out in for an afternoon. Lucrepata | Located right next to San Blas, Lucrepata is an up-and-coming neighborhood with a pleasant residential feel. A great spot for those looking for a longer-term Airbnb in Cusco. San Cristobal | You'll find the San Cristobal neighbourhood high up on a hill overlooking Cusco, so named because of the large and impressive church of the same name. It’s known for its beautiful views, as well as being the area closest to Sacsayhuaman. Most hostels and hotels are located next to Plaza de Armas or San Blas, with most of the old town and places of interest being no longer than 10 minutes walk away Plaza de Armas which is the hub of tourism in Cusco. Cusco is a very walkable city, and that’s the best way to uncover it, but there are definitely times the you’ll want to take a taxi. We had episodes of waiting up to 10 minutes for a fare to get picked up, numerous taxi drivers cancelling on us, and even one turning up, coming out with some nonsense about traffic in an elaborate ploy to cancel the Uber fare and attempt to take us in his meter at a higher cost (we had some pretty choice words for this particular gentleman). We should also mention that there are buses taking locals all over the city which you can just hop on and off of, with a ticket costing S/. 1. It’s not often that difficult to find something vegetarian in South America, but finding something tasty? That’s a little trickier. Thankfully, when it comes to cruelty-free cuisine, Cusco excels. Seriously, it’s really, really good and non-vegetarians will love eating at a number of these restaurants. The Green Point | Totally vegan with exceptionally good almuerzos (set lunch menus, which are very common in Peru) for S/. 18 (£4 / $5.5) . Pretty much everybody passes through the doors of Green Point once - irrespective of dietary preferences. Qura Bowl Bar | Buddha bowls filled with all sorts of wonderful fresh ingredients (and great coffee). Taste of India - Cafe Carvalo | Not strictly a vegetarian restaurant, but served a bloody delicious paneer curry that we still dream about (perfect if you’ve just come back from the Inca Trail). The Vegan Temple | All vegan, excellent curries and phenomenal burgers. Salud! De Luz | If you happen to be vegan with soy or gluten intolerances, this is the place to go. Best for lunch. Vida Vegan Bistro | Exceptionally good food with impeccable presentation, and the sort of vegan food that will impress even meat-eaters. The lasagne and pizza come highly recommended! As we mentioned, almuerzos are set lunches and you’ll find these all over Cusco at local eateries, offering two courses (usually soup ten a rice + meat dish) from as little as S/. 6 - S/. 12. Whilst you can certainly pass a day or two in Cusco simply roaming the streets and popping into shops, restaurants, and small alleys that take your fancy, much of what is on offer within (and outwith) the city limits is only accessible with a special ticket - known as the boleto turistico (translation - ‘tourist ticket’). The issue with the boleto is that it’s not that cheap, there are a variety of options to choose from, and time limits in which to use it. Ideally, you should take a moment before you arrive to understand what attractions it covers, what attractions you’d like to explore, and how much you can afford to spend. For most visitors to Cusco and the Sacred Valley though, it is an essential purchase. Of course, you can buy the tickets in advance (and if you’d like to go up Huaynacpicchu, you absolutely must, at least a few months before your planned date), but if your travel plans are a little looser, you can simply pop in to the Direccion Regional de Cultura office in Cusco when you arrive in the city and buy your ticket. You can find them at Casa Garcilaso on Calle Garcilaso, just before the Plaza Regocijo and close to the Museo de Chocolate (note that they’re closed on Sundays). Even for the most independent traveller, there will be a few day trips and excursions that will require a tour (Rainbow Mountain, for example). One thing to bear in mind however, is that not every tour is created equal - as evidenced by the plethora of offerings on display at tour agencies all over the city. If money is tight (or, like us you have a little paranoia about getting ripped off), be sure to shop around. Prices can vary significantly between those you’ll get if you were to book your tour a couple of months in advance and what you can negotiate directly the day before. We’re not going to lie; we bloody love a good cup of coffee - and travelling throughout a region which creates some of the world’s best means we took every opportunity possible to try it all. Usually in some exceptionally lovely coffee shops. When we were researching our time in Cusco, one brand of coffee kept coming up and being recommended to us by our Instagram followers - Three Monkeys. It took little time for us to track it down, and to agree that yes, indeed, it’s pretty damn good (although it is just a street cart, not a cafe!). 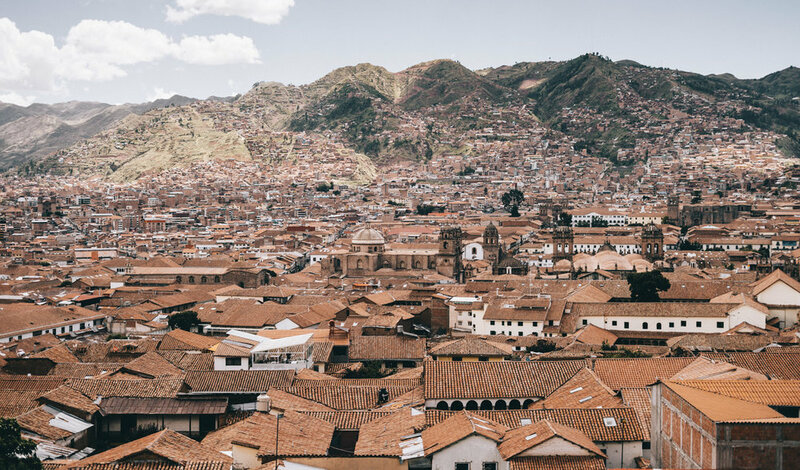 Keep Reading | We’ve gone into lots of detail about our favourite coffee shops - including those which are best for digital nomads to work from - in our guide to Cusco. Despite what some people tell you, the water in Cusco really isn’t for drinking (trust us, we tried). We cooked with it without any problems, ate in the market and didn’t do anything daft like bring our own bottled water to wash salad in restaurants (yep, some people have done this) but for drinking, the water went into our filter water bottle before it went into our mouths. Do the environment - and your wallet a favour - and don’t head to Peru or South America without investing in travel filter bottle, which allows you to fill up from any water source and drink safe, clean water almost instantly. We are big fans of Water-to-Go (get 15% off with our code ‘ADR15’) whilst a LifeStraw is another good option. Keep reading | How to use less plastic when you travel. As far as large Latin American cities go, we found Cusco to be and feel incredibly safe, and even wandering around the streets relatively late at night with all our camera equipment, we didn’t feel unsafe. Of course, we took natural precautions, and didn’t make ourselves easy targets, but you needn’t be unduly worried about security when visiting this part of the country. There are also a number of tourism and regular police within the centro historico for peace of mind. As ever though, be sensible and be cautious. And lastly, try not to let your patience wear thin in the face of the people on the streets offering tours, massages, asking if you want to take a photo of them, or offering to find you accommodation - it does become annoying but they’re just trying to earn a living.